The C&C Sutlery CS Enlisted Single Breasted Frock Coat is made of 20 oz Wool and is Untrimmed. The Frock Coat can be made with a 6, 7, 8, or 9 Button Front of CSA, Block A, Block C, or Block I Buttons. 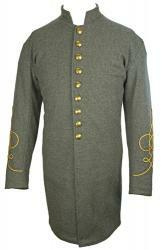 There is a 2 Button Functional Cuff on the sleeve and a 2 Button Enlisted Pattern on the back of the coat's skirt. The Coat Body is Lined to the waist. The skirt is unlined and the skirt hem is raw per the originals. There is 1 Inside Pocket. The C&C Sutlery CS Enlisted Single Breasted Frock Coat is made of 20 oz Wool and features Branch of Service SOLID trim on the Collar and Cuff. The Frock Coat can be made with a 6, 7, 8, or 9 Button Front of CSA, Block A, Block C, or Block I Buttons. 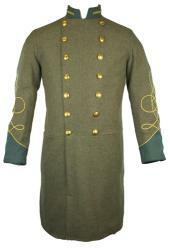 There is a 2 Button Functional Cuff on the sleeve and a 2 Button Enlisted Pattern on the back of the coat's skirt. The Coat Body is Lined to the waist. The skirt is unlined and the skirt hem is raw per the originals. There is 1 Inside Pocket. NOTE: Chevrons are available at an additional charge. The C&C Sutlery CS Enlisted Single Breasted Frock Coat is made of 20 oz Wool and features Branch of Service PIPING trim on the Collar and Cuff. The Frock Coat can be made with a 6, 7, 8, or 9 Button Front of CSA, Block A, Block C, or Block I Buttons. 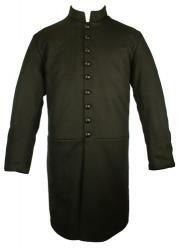 There is a 2 Button Functional Cuff on the sleeve and a 2 Button Enlisted Pattern on the back of the coat's skirt. The Coat Body is Lined to the waist. The skirt is unlined and the skirt hem is raw per the originals. There is 1 Inside Pocket. 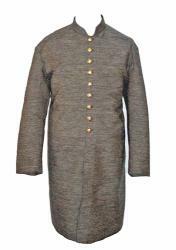 The C&C Sutlery CS Enlisted Single Breasted Frock Coat is made of Jean Wool and is Untrimmed. The Frock Coat can be made with a 6, 7, 8, or 9 Button Front of CSA, Block A, Block C, or Block I Buttons. 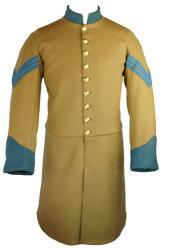 There is a 2 Button Functional Cuff on the sleeve and a 2 Button Enlisted Pattern on the back of the coat's skirt. The Coat Body is Lined to the waist. The skirt is unlined. There is 1 Inside Pocket. 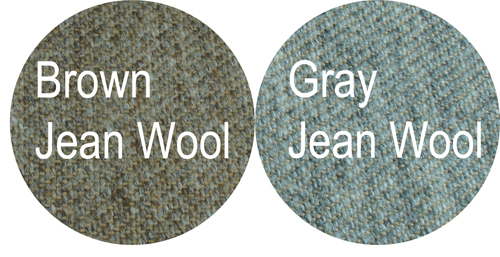 The coat is available in Brown or Gray jean wool. The C&C Sutlery CS Enlisted Single Breasted Frock Coat is made of Jean Wool and features Branch of Service SOLID trim on the Collar and Cuff. The Frock Coat can be made with a 6, 7, 8, or 9 Button Front of CSA, Block A, Block C, or Block I Buttons. 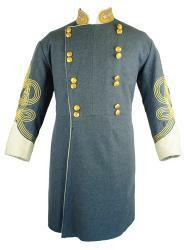 There is a 2 Button Functional Cuff on the sleeve and a 2 Button Enlisted Pattern on the back of the coat's skirt. The Coat Body is Lined to the waist. The skirt is unlined. There is 1 Inside Pocket. The C&C Sutlery CS Enlisted Single Breasted Frock Coat is made of Jean Wool and features Branch of Service PIPING trim on the Collar and Cuff. The Frock Coat can be made with a 6, 7, 8, or 9 Button Front of CSA, Block A, Block C, or Block I Buttons. 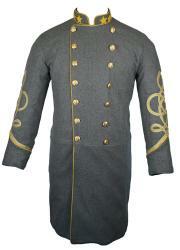 There is a 2 Button Functional Cuff on the sleeve and a 2 Button Enlisted Pattern on the back of the coat's skirt. The Coat Body is Lined to the waist. The skirt is unlined. There is 1 Inside Pocket. The C&C Sutlery CS Junior Officer Single Breasted Frock Coat is made of 15-16 oz Broadcloth Wool and is Untrimmed. 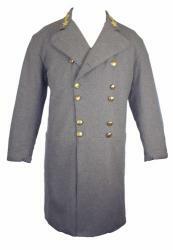 The Frock Coat features a 9 Button Front of CSA, Block A, Block C, or Block I Buttons. The coat has a 3 Button Functional Cuff on the sleeve. There is a 6 Button Pattern on the back of the coat's skirt and the folds of the skirt conceal additional pockets. The Coat Body and Skirt are fully Lined with Black Cotton. There is 1 Inside Pocket. Gold Soutache Sleeve Braid for Lieutenant (1 Row) or Captain (2 Rows) and Collar Insignia are available at an additional charge. The C&C Sutlery CS Junior Officer Single Breasted Frock Coat is made of 15-16 oz Broadcloth Wool and features Branch of Service SOLID trim on the Collar and Cuff. 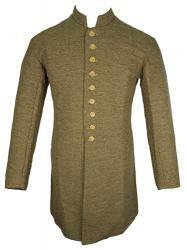 The Frock Coat features a 9 Button Front of CSA, Block A, Block C, or Block I Buttons. The coat has a 3 Button Functional Cuff on the sleeve. There is a 6 Button Pattern on the back of the coat's skirt and the folds of the skirt conceal additional pockets. The Coat Body and Skirt are fully Lined with Black Cotton. There is 1 Inside Pocket. Gold Soutache Sleeve Braid for Lieutenant (1 Row) or Captain (2 Rows) and ;Collar Insignia are available at an additional charge. The C&C Sutlery CS Junior Officer Single Breasted Frock Coat is made of 15-16 oz Broadcloth Wool and features Branch of Service PIPING trim on the Collar and Cuff. 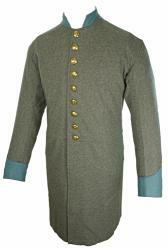 The Frock Coat features a 9 Button Front of CSA, Block A, Block C, or Block I Buttons. The coat has a 3 Button Functional Cuff on the sleeve. There is a 6 Button Pattern on the back of the coat's skirt and the folds of the skirt conceal additional pockets. The Coat Body and Skirt are fully Lined with Black Cotton. There is 1 Inside Pocket. 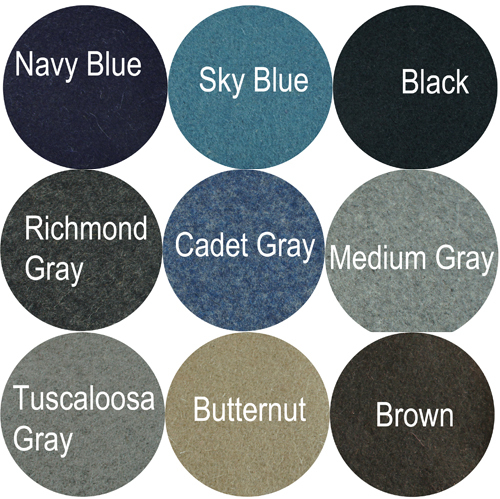 The C&C Sutlery CS Officer Double Breasted Frock Coat is made of 15-16 oz Officer Grade Broadcloth Wool and features a 14, 16, 18, or 24 Button Front of CS Staff Buttons or CSA Buttons. 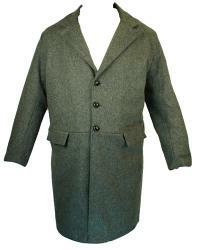 This Frock Coat has a Untrimmed Collar and Cuff. The sleeves feature a 3 Button Functional Cuff. There is a 6 Button Pattern on the back of the coat's skirt and the folds of the skirt conceal additional pockets. The Coat is Fully Lined with Black Cotton. There is 1 Inside Pocket. 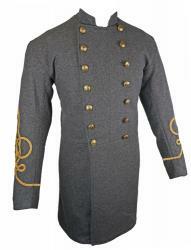 NOTE: The coat pictured features optional collar insignia & sleeve braid. Branch of Service Trim IS NOT available on this version. 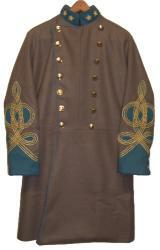 The C&C Sutlery CS Officer Double Breasted Frock Coat is made of 15-16 oz Officer Grade Broadcloth Wool and features a 14, 16, 18, or 24 Button Front of CS Staff Buttons or CSA Buttons. 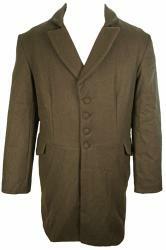 This Frock Coat features a Branch of Service SOLID Trim on the Collar and Cuff. The sleeves feature a 3 Button Functional Cuff. There is a 6 Button Pattern on the back of the coat's skirt and the folds of the skirt conceal additional pockets. The Coat is Fully Lined with Black Cotton. There is 1 Inside Pocket. 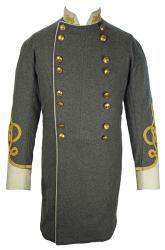 NOTE: The coat pictured features optional collar insignia & sleeve braid. 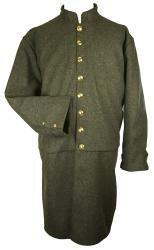 The C&C Sutlery CS Officer Double Breasted Frock Coat is made of 15-16 oz Officer Grade Broadcloth Wool and features a 14, 16, 18, or 24 Button Front of CS Staff Buttons or CSA Buttons. 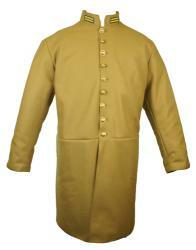 This Frock Coat features a Branch of Service PIPING Trim on the Collar and Cuff. The sleeves feature a 3 Button Functional Cuff. There is a 6 Button Pattern on the back of the coat's skirt and the folds of the skirt conceal additional pockets. 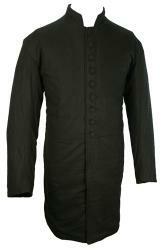 The Coat is Fully Lined with Black Cotton. There is 1 Inside Pocket. 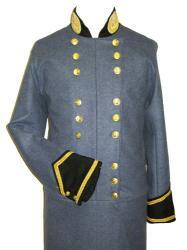 NOTE: The coat pictured features optional collar insignia & sleeve braid and piping trim on the lapels and skirt.